Enterprise Suite is a rogue antispyware program. 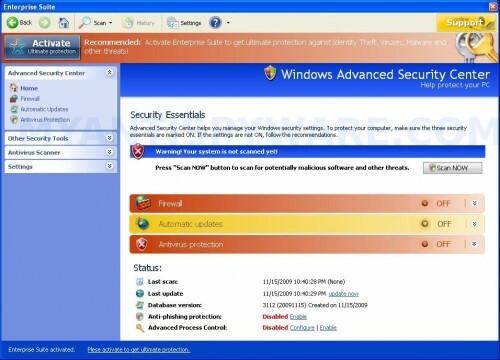 The rogue is very similar with the previously known scareware called Windows Enterprise Suite. Enterprise Suite spreads through trick tactics which presuppose the use of fake online malware scanners that stats that your computer is infected and that you must install special software to clean your computer. The software is a installer of Enterprise Suite. Once downloaded and started, it will install the rogue antispyware tool and create numerous files with random names in %UserProfile%\Recent folder. The files are made to appear as infections, but are in reality harmless. When Enterprise Suite is installed and started, it will perform a scan of your computer and lists previously created files as infections. Important to know that all of these infections are fake, the rogue is incapable of detecting and exterminating any computer infections. So you can safely ignore all that Enterprise Suite shows you. Also Enterprise Suite will hijack Internet Explorer and randomly shows a “There is a problem with this websites`s secuirty” warning page. However, all of these alerts and warnings are fake and like scan false results should be ignored! If you find that your system is infected with this malware, then most importantly, do not purchase it. Use the removal guide below to remove Enterprise Suite from your computer for free. Select Perform Quick Scan, then click Scan, it will start scanning your computer for Enterprise Suite infection. This procedure can take some time, so please be patient. Make sure that everything is checked, and click Remove Selected for start Enterprise Suite removal process. When disinfection is completed, a log will open in Notepad and you may be prompted to Restart.